Some services are especially attractive to the younger members of the congregation. On the third Sunday of each month, an All Age Service, consisting of worship songs accompanied by a music group, prayers and a ‘family-friendly’ talk. The service, which lasts no more than 45 minutes, is preceded or followed by refreshments. It alternates each month between the churches at Stone and Appledore. ‘Messy Church’ takes place on an occasional basis, either in Stone Memorial Hall or in Appledore Church. Messy Church, which is part of a world wide movement, is an opportunity to worship in a very informal atmosphere, to take part in creative activities, which centre on a Biblical theme … and to enjoy some delicious food! It is not just for children, but is a way for everyone, at all stages of their faith journey, to enjoy Church. 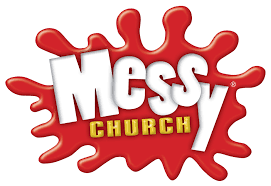 Children attending Messy Church should be accompanied by a responsible adult, please. Special services take place through the Church Year. These include Candlemas, Easter Day, Harvest Thanksgiving, Remembrance, Carol Service and (especially suitable for young children), the Crib Service at 3pm on Christmas Eve. Your children may be interested in joining the church choir (see the choir page), or, if over 12, learning to ring the bells (see the bells page). Learning to play an instrument? Appledore Church has a music group which plays at some services at Stone, as well as at Appledore. For further information please contact Rev’d Tricia Fogden on 01233 758 250 or by email. The primary school which serves Stone is at Wittersham. It has a strong Christian ethos with close links between church and school. Amongst its activities is ‘Open the Book’. Its ‘Open the Book’ leads school assembly at Wittersham School three times a term. Through dramatic action and interactive story-telling, the children are introduced to some of the great classic stories of the Bible, see more at Open the Book.